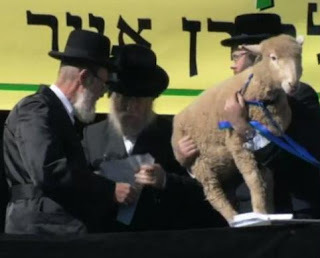 A sheep is presented to the Kohen to redeem a male donkey. Last October we reported on one of the most unusual and infrequent Jewish observances, Petter Chamor, redeeming a firstborn donkey with a sheep as described in the Torah (Exodus 13:13). That ceremony was conducted in Melbourne, Australia, by members of the Adass Yisrael Congregation. In a study session, two members of the congregation discovered that when the firstborn of a donkey owned by a Jew is a male, the owner has to redeem the firstborn by giving a sheep to the Kohen. This is similar to Pidyon HaBen, the ceremony in which a firstborn human male is redeemed by giving coins to the Kohen. Last Sunday, the rare ceremony was performed in the Catskill Mountain camp of the Sanz-Klausenberg Chassidic sect in upstate New York. The event was attended by thousands of people from a variety of backgrounds who were vacationing in the area, and dozens of Rabbis including the Klausenberger Rebbe, leader of the sect. Why should a donkey have to be redeemed? The sages tell us that it's in recognition of the service that donkeys performed as pack animals, carrying the belongings of the Jewish people during the Exodus from Egypt. You may have attended a Pidyon HaBen, but it's unlikely that you've seen a Petter Chamor. So here's your chance to see what you missed by not being in the Catskills last Sunday. Enjoy! Pidyon Peter Chamor from CrownHeights.info on Vimeo. I think that to thank animals for serving is a beautiful thing ,If it seems strange to some , customs that people are not familiar with always seem strange ,however respect & admiration for other peoples customs are the key.